Apart from coming out of different taps, some ales seem very similar to lagers (although there are clearly a much greater variety of ales). Is there a difference in the way they are made? Ale yeast strains are best used at temperatures ranging from 10 to 25°C, though some strains will not actively ferment below 12°C (33). Ale yeasts are generally regarded as top-fermenting yeasts since they rise to the surface during fermentation, creating a very thick, rich yeast head. That is why the term "top-fermenting" is associated with ale yeasts. Fermentation by ale yeasts at these relatively warmer temperatures produces a beer high in esters, which many regard as a distinctive character of ale beers. Lager yeast strains are best used at temperatures ranging from 7 to 15°C. At these temperatures, lager yeasts grow less rapidly than ale yeasts, and with less surface foam they tend to settle out to the bottom of the fermenter as fermentation nears completion. This is why they are often referred to as "bottom" yeasts. The final flavour of the beer will depend a great deal on the strain of lager yeast and the temperatures at which it was fermented. 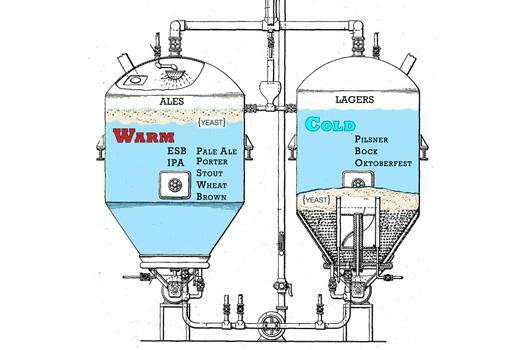 The first part of the picture depicts the description in my answer about where the yeast "works," the temperatures at which they work, and then some common types of ales/lagers. The second picture shows S. cerevisiae (common ale yeast) and a wild yeast S. eubayanus making some new cold tolerant yeast strain babies that are the common lager yeast (S. pastorianus). Note: my biology is rusty but from my reading and looking at the picture, this is what I derived. Source: Twenty Things Worth Knowing About Beer. Ales and lagers are brewed with different types of yeast. Ale yeast ferments at the top of the brewing vat at a comfortable room temperature while lager yeast ferments at the bottom of the vat at a lower temperature. The "low and slow" lager fermentation brings out more complex flavors. The primary difference is the yeast used to ferment the beer -- ales use yeasts strains which work at a warmer temperature (10-25 deg C) than lager yeasts strains (7-15 deg C). You may hear the terms "top-fermenting" for ale yeasts and "bottom-fermenting" for lagers, but I think that's more-or-less happen-stance -- the yeasts themselves are not inclined toward a particular altitude. The main difference between the two is the different types of yeast that they both use. Lager yeasts are more tolerant to cold temperatures and so are fermented at a lower temperature. This is what gives the lager a crisp flavour. The ale yeasts ferment at higher temperatures and take less time to complete as the yeast is more active the higher the temperature. Not the answer you're looking for? Browse other questions tagged brewing ale lager or ask your own question. Why is it a Ginger “Beer” and not a Ginger “Cider”?